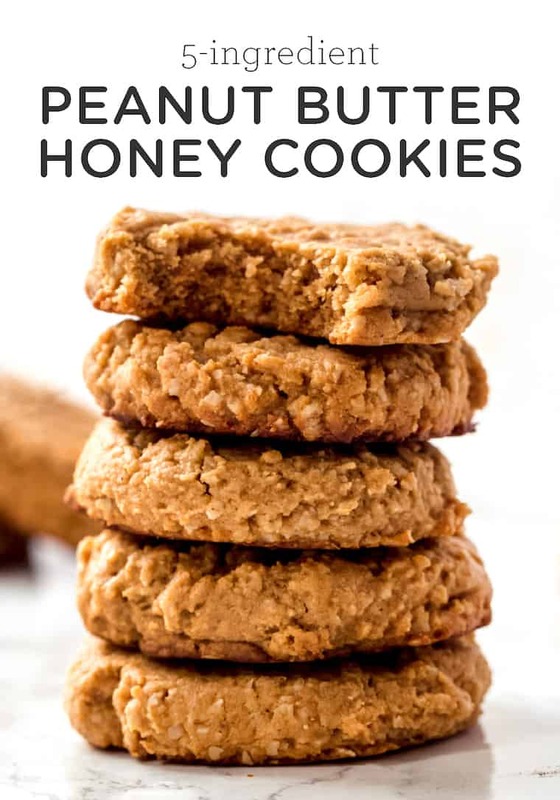 These peanut butter honey cookies are healthy, gluten-free and have the perfect texture. Not to mention they use just 5 ingredients and taste absolutely amazing! I find that I'm constantly on the hunt for new cookie flavors. Whether it's reinventing a classic chocolate chip cookie, or creating my own whacky combination like blueberry breakfast cookies, I never stop dreaming up flavor combinations. One of my favorite things to do is take a classic cookie combo and give it my own healthy twist. 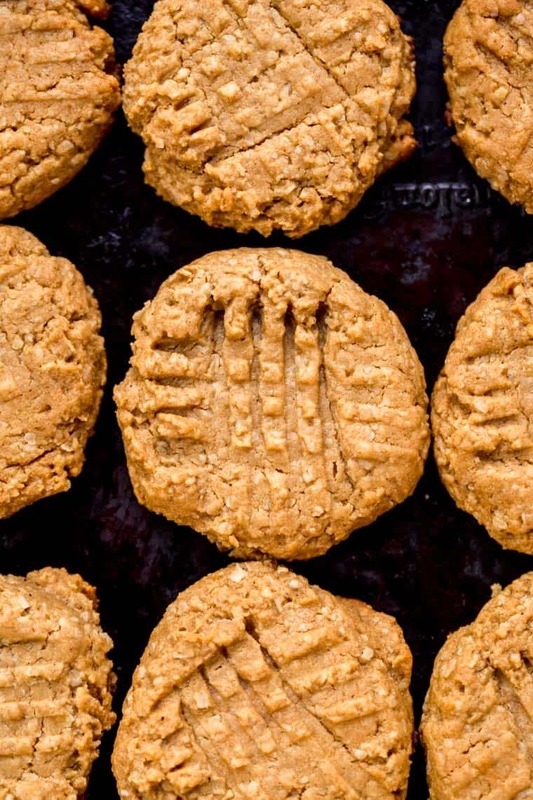 Which is exactly what we're doing with these peanut butter honey cookies! I'm taking the classic peanut butter cookie, and flipping it on its head by using nutritious ingredients. When you're making traditional peanut butter cookies, you can one of two ways: 1) the flourless route, 2) the flour(full) route. However, both options use a lot of sugar. 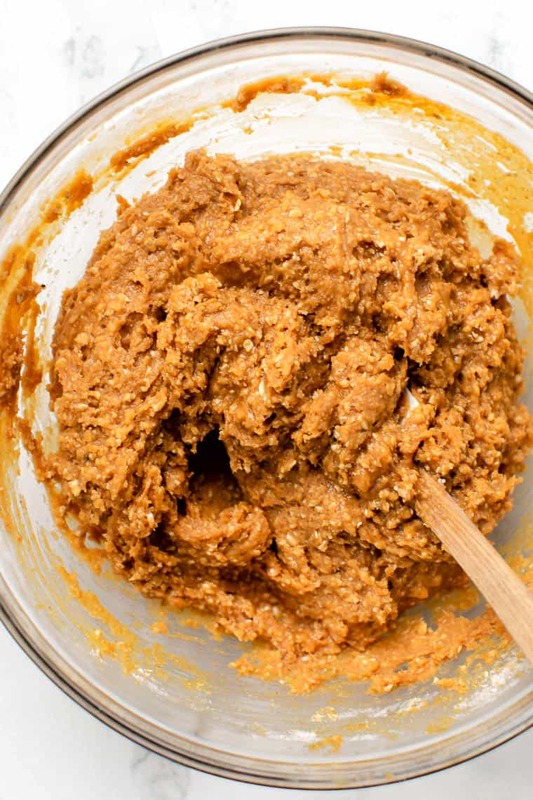 You know the classic 3-ingredient peanut butter cookie recipe? We're talking about upwards of 2 cups of sugar per batch. Which to me just sends the alarms blasting! That's right! 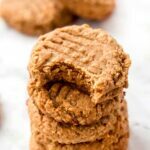 Just 5 ingredients, one bowl and probably one of the best peanut butter cookie recipes out there. These might just be the easiest cookies you'll ever make. I mean most cookies are easy, but these are made in just one bowl and don't require any chilling. You'll start by beating together your peanut butter, sugar and honey. Once that's combined and smooth, add in your oat flour and baking soda. Scoop them onto a parchment-lined baking sheet and bake! Why Do You Fork Peanut Butter Cookies? One thing I like to do before baking – which gives them that classic peanut butter cookie look – is to make a quick little crosshatch pattern on top. 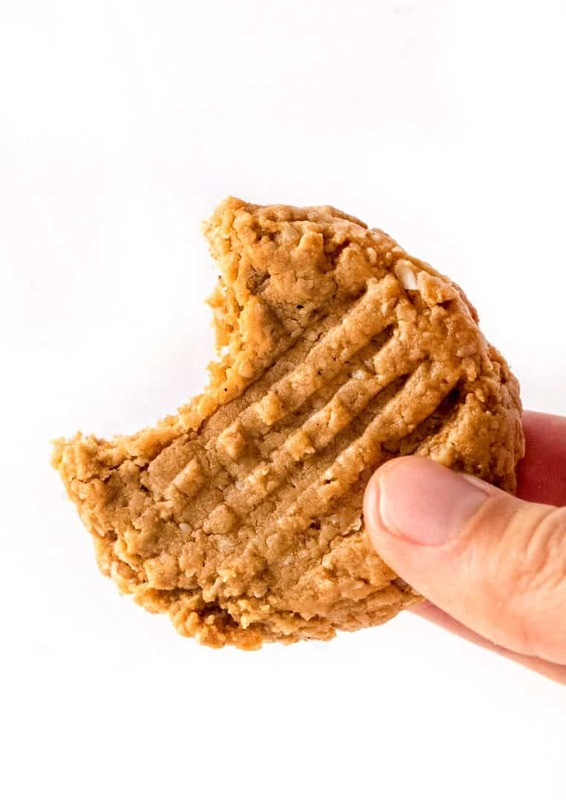 The reason you want to fork peanut butter cookies is two-fold: 1) it makes them look pretty and 2) it helps them get a more even bake since you're gently flattening them. All you need to do for that is shape your cookies into a somewhat even ball, then use the back of a fork to gently press down on the ball. Lift the fork up, then press down again, but this time the prongs go across the lines you just made. That will create your crosshatch! And since these peanut butter honey cookies have baking soda, they'll puff up nicely and give you that lovely classic look. How do you Tell if Peanut Butter Cookies are Done? 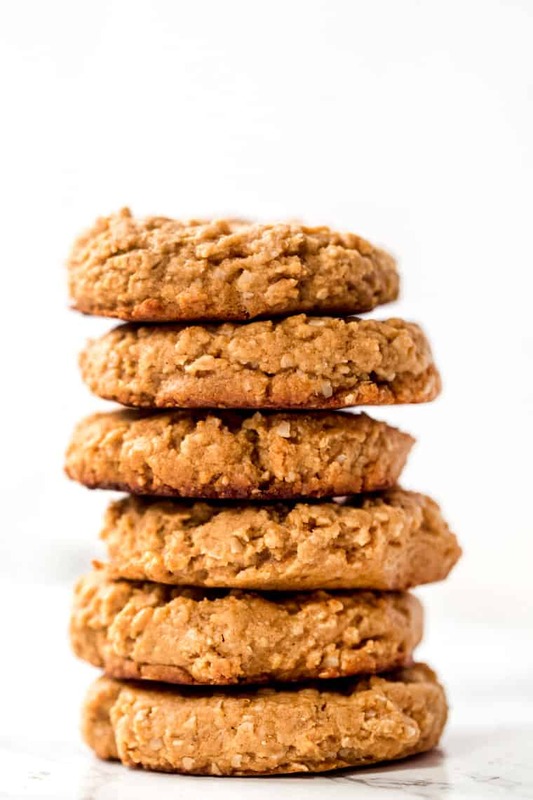 Peanut butter cookies take no more than 8 – 10 minutes to bake. You're looking for them to have a golden brown top (although that can be hard to see because they're already golden brown), and slightly darker edges. Especially since we're using honey in these cookies, the bottoms are prone to burning. It might seem a little counterintuitive, but when your peanut butter cookies are done they will still be soft. You don't want them to be crispy out of the oven – they'll turn into rocks once they're cooled. As they cool they'll firm up and the outsides will get nice a little crispy, while the inside will stay soft and chewy. And that, my friends, is how you make the ultimate peanut butter honey cookie. They're easy and delish! 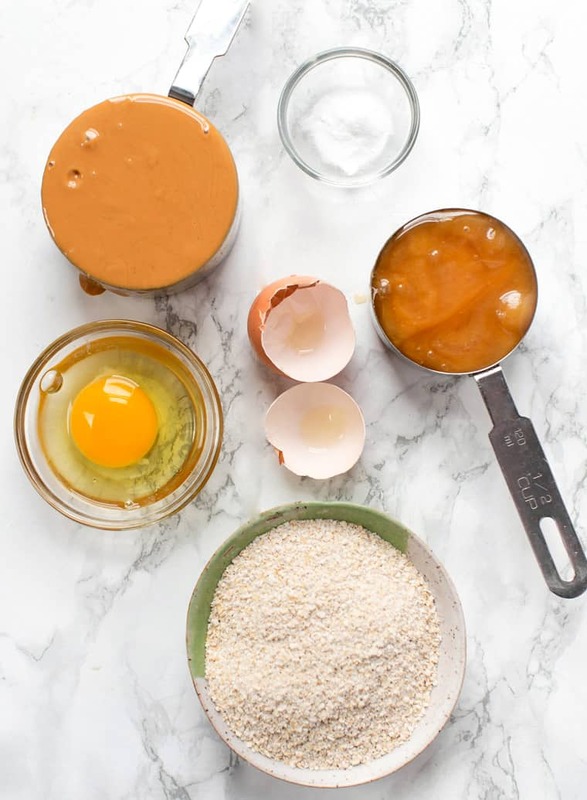 In a mixing bowl, beat together the peanut butter, honey and eggs. Beat in the oat flour and baking soda. Scoop the dough into tablespoon-sized scoops and form into balls. Place on a baking sheet and gently flatten. Use a fork to make a cross hatch pattern on the top. Bake on the center rack for 8 - 10 minutes until the cookies are lightly golden brown. Remove from oven, allow to cool on the pan for at least 15 minutes. This allows the cookies to "set". Slightly reheat in the microwave if desired and enjoy! Can sunbutter be used because of a peanut allergy? Can coconut or quinoa flour be used? I’m allergic to oats and rice flours also. Yep on the sunbutter no on the coconut. I think you could try quinoa flour though! Hi, I was wondering if I can replace the PB with PB2 powder? And if yes, how much PB2 would I need? These sound delicious but cant eat regular PB. Thanks very much & look forward to hearing from you. I haven’t done any cooking or baking with PB2 so I’m not sure. Maybe if you mixed it with water to create a sort of peanut butter consistency? Sorry!